There are 37 distinctively styled en-suite guestrooms within the Castle. Each luxurious room retains an original, cultivated style that is in keeping with the period of the property. Spaciousness and high ceilings, along with opulent fabrics and period furniture, effortlessly highlight the singular heritage of the Castle. Kinnitty Castle Hotel offers four different types of guestrooms: Abbey Court Rooms, Baronial Rooms, State Rooms, and Castle Suites. Each of the bedrooms has been individually named after historic people and places linked with the notable and enduring history of the Castle. Most recently, one of the State Rooms has been renamed after Lt. Michael P. Murphy during a recent ceremony honoring all Irish and Irish American Medal of Honor Recipients. The Castle is steeped in tradition and it is one of the reasons it is amongst the top castle accommodation Ireland has to offer. Every guestroom features spacious elegance, luxurious surroundings, and warm restful colors that guarantees a pleasurable stay and ensure guests feel like a King or Queen. 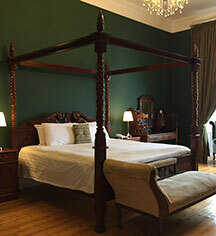 The State Rooms boasts original period features including fireplace, cast iron roll-top bathtubs, and luxurious drapes. For those seeking the best, stay in the spacious Castle Suites, with views of the front of the Castle and sightings of the estate deer in the front field. 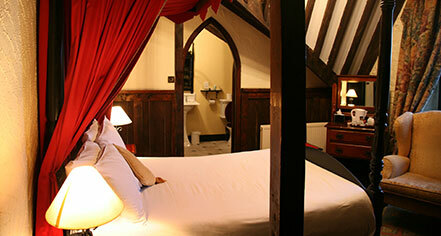 The suites are beautifully appointed and are individually styled in keeping with the Castle's history and heritage. The suite baths include a cast iron roll-top tub and individual shower, with plush bathrobes and slippers.